"I'm scared ... It's a mystery, oh my gosh!" Maria Actis, 85, has lived through the invention of the microwave oven, cable television, the lint roller and the personal computer. But now she has a new device to master: Google Home. 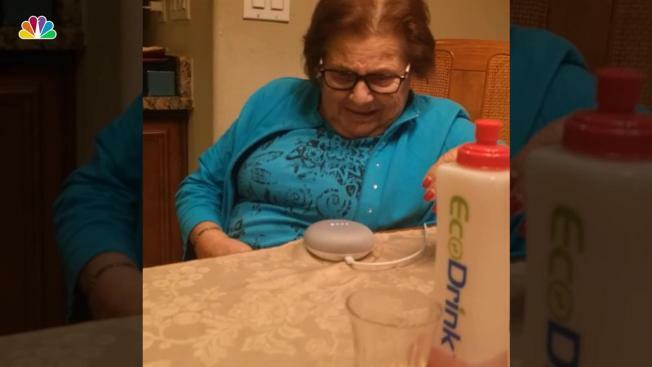 The adorable grandmother — with a thick Italian accent — was given the voice-activated tech toy for Christmas, and now a video of her getting to know it is going viral. Grandson Ben Actis posted a video of Maria to YouTube on Dec. 27, and the clip now has more than 1.2 million views. The sprightly grandmother is seen struggling with the concept of how to activate Google Home, saying "Hey, Google" or "O.K., Google." She alternately tries tapping the device, or just says "Google" into the device. But when it does speak back to her, telling her the weather in her town, she gets a fright, jumping up from her seat. "I'm scared," she says. "It's a mystery ... oh my gosh!" Watch the video above to see the delightful Maria entertain her family as she works out the new device.